Considering how vital link building is to an Internet marketing campaign, it sure comes wrapped in a lot of mystery. The hosts look at link building on today’s show, starting with a discussion of tactics and best practices. Bruce, Susan and Virginia give their thoughts on link solicitation requests, link bait creation and the real value of inbound links. Most link building tactics can be used in appropriate and inappropriate ways, such as reciprocal linking vs. site partners and paid links vs. advertising links. A good test for whether a link is appropriate is the usefulness of the link for a user. Link building expert Todd Malicoat, aka Stuntdubl, talks to Virginia about his recommendations for link development. At Stuntdubl.com, Todd publishes, among other topics, link-related posts on training, link bait, social media, link quality indicators and more. In a recent post, Link Development Training: How Link Building for SEO is Like Picking Up a Girl, the list of recommended tasks and things to look for is a good reminder for link developers of any level. He also offers his opinion on why link building is still considered a black box of SEO. Then Bradley, Susan and Virginia try to uncover the truth behind link building secrets. Link development expert Debra Mastaler wrote a revealing post called The Only Link Building Secrets Out There Are The Ones You Don’t Listen To. Rather than looking for a magically easy solution to the challenge of link building, devote the strategy, planning, time and resources necessary to develop quality links. Save the time you’d spend searching for secrets and use it on careful, strategic link building instead. A number of search engines have come and gone since the early days of the Internet. Today’s dominant player, Google, has shown a unique ability to continually rise to challenges from new engines. Wolfram Alpha is the latest engine to enter the ring, but rather than positioning itself as a direct competitor to Google, the engine is a “fact” or “answer” engine that compiles and visualizes data. Bruce, Susan and Virginia consider the role of alternate engines, such as Wolfram Alpha, and the unique functions they perform. Virginia then talks to Barbara Baker, of Kolbe Market Consultants, about the search evolution and what the search future may hold. In 12 years as a search marketer, Barbara has witnessed the search engine changing of the guards more than once. But as Barbara sees it, a formidable challenger to the Google will depend on the discerning abilities of the human mind — one technology that is difficult to reproduce. Barbara points to Twitter as an example of the kind of info gathering resource to come. Then Maryann, Susan and Virginia look at the way Google responds to challengers. Bloggers pointed out that Google has conveniently rolled out new competitive features in the face of Wolfram Alpha, Cuil and social media sites. Matt Cutts has written a post to dispel the rumors, yet the hosts still believe Google could purposefully release developing projects in order to dampen the other product’s publicity. 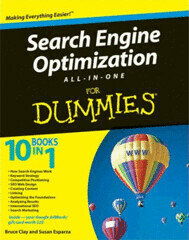 Search Engine Optimization All-In-One For Dummies has hit book store shelves. Bruce and Susan authored the desk reference guide that combines ten books in one. They explain the purpose of the book and share their experience of working on a comprehensive technical guide. New and experienced search engine marketers alike can benefit from this easy-to-read guide to search engine optimization. Christopher Hart, Bruce Clay, Inc.’s director, Eastern Region Operations, then talks to Virginia about SEOToolSet Training on the East Coast. During April, Chris and Bruce presented the course on the East Coast for the first time. Chris discusses the complementary nature of SEO All-In-One For Dummies and the training course material, illustrating the many ways the company shares its methodology and knowledge. SEOToolSet Training will return to New York June 9-11. To showcase the content of the book with a little more detail, Susan, Maryann and Virginia take an in-depth look at one of the subjects covered in the book. One of the ten books is dedicated to competitive analysis, a corner stone of search engine optimization. Researching your competition will give you an idea of keywords to target. You can also see what they’re doing right that you may want to do as well, and what they’re doing wrong, which you should avoid. News moves fast in the search marketing industry so today’s show is all about recent Internet marketing headlines. Bruce, Robert and Virginia look at the expansion of local results for non-geo queries and what it means for SEOs and small businesses. The fact that local results are listed for relevant non-local queries will benefit small businesses and may change searcher behavior. Jordan Kasteler, co-founder of Internet marketing company Search & Social and co-host of the WebmasterRadio program Mobile Presence, shares his thoughts on a number of social media news stories. Virginia and Jordan talk about Digg’s PageRank-passing ad links, if Twitter will be acquired in the next year, and how important it is to target social media sites in your link building campaign. Rounding out the show, Virginia, Susan and Michael explore a few more recent industry news stories. Bruce Clay, Inc. has released two new SEO tools: a Firefox version of the SEMToolBar as well as a new tool that gives you one convenient place to see how many pages of a domain are indexed in the three biggest search engines. They also discuss Google Me profiles and the new Google Analytics API.